For so much of the year Sydney-siders take the beautiful bridge captured in the image above as a normal part of Sydney life and skyline and spare it little thought. As New Year approaches though, many turn their attention to achieving the best possible view of the icon as it becomes the centre of Sydney’s New Year festivities. 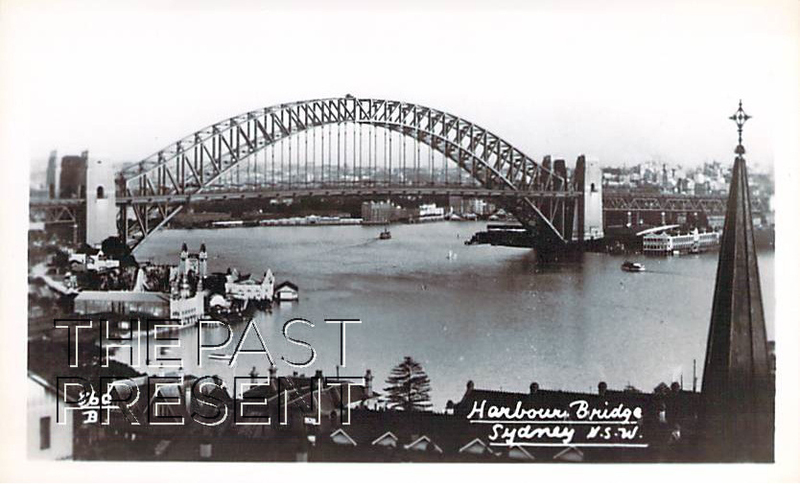 The Sydney Harbour Bridge which is today such an icon of the Harbour City was, at the time of its opening in 1932, an engineering masterpiece at a whole new level. Yet the history of the bridge dates back over a century before to when convict architect Francis Greenway suggested building a bridge, in roughly the same location, to Governor Macquarie. Of course, this didn’t come to pass, but by Federation in 1901 the need for such a bridge was well recognised and in 1900 submissions for a bridge design were even called for, but they were all unsatisfactory and plans were yet again put aside. It was after World War 1 when the real quest for a bridge began. Tenders, overseen by Dr J.J.C Bradfield, for either an arch or cantilever bridge were called for in 1923. Bradfield would ultimately oversee the entire design and building process. It was Dorman Long and Co. Ltd, a company from England, which won the tender, for their arch bridge designed by Sir Ralph Freeman. Construction began in 1924, displacing hundreds of families whose homes were resumed and demolished, without compensation, to make way for the bridge. Come back next week to learn more about the history of Sydney’s iconic bridge. 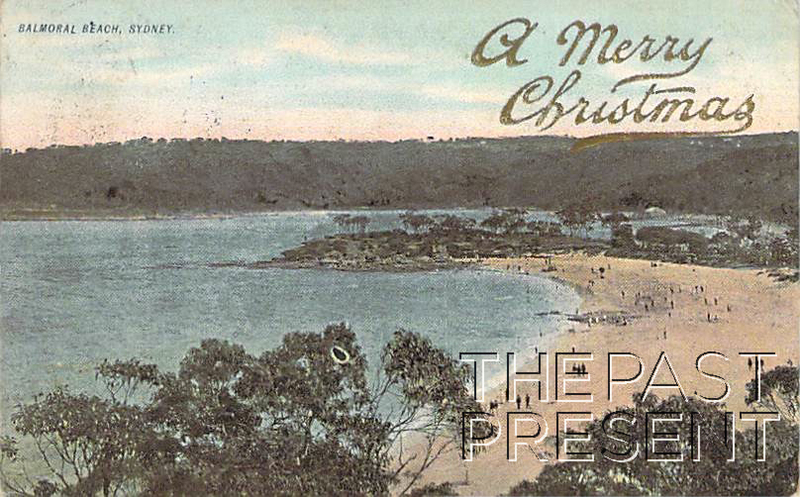 The above postcard is a festive glimpse into the history of Sydney’s beautiful Balmoral Beach in the inner harbour. This area has long been popular for picnicking and bathing, and with so many Australians enjoying the beach this Christmas season, it is likely to see many more! Balmoral may have been a popular destination for Sydneysiders for well over a century, but for many years it was not the easiest beach to access. It was not until 1922 when a tram line was established to the beach that Sydney residents and visitors alike could make full and easy use of the beach. Today you can see the former tram waiting shed opposite Hunter Park, a relic of the era of trams. In 1958 buses replaced the trams, but people continued to flock to the beach. The tram line and the explosion in visitors which it brought to the area allowed a great deal of progress along the beach. In 1923 Joels Boatshed was established near Balmoral Baths and in 1924 the Promenade was completed. The Promenade was an important part of the Balmoral Beautification Scheme and allowed visitors to walk above the beach on a paved path should they wish to avoid the sand. The southern section of the promenade was finished in 1927 and the Great Depression public works schemes provided funding for the bridge to Rocky Point. The bridge, along with the Rotunda and the Bathers Pavilion which were also funded by public works schemes were to be completed by 1930 and are still there today! Despite the rain, we have had a lot of warm weather recently in Sydney and in the heat Sydneysiders head for the many beaches around the city. 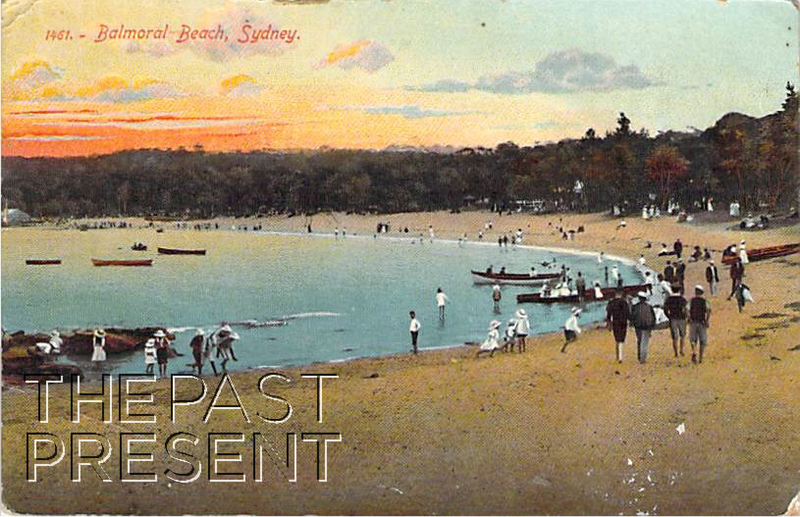 Bathing has long been a popular pastime in Sydney and Balmoral, which is pictured in the postcard above, has long been a popular destination for Sydney bathers. Balmoral in the inner harbour has been part of Sydney’s European history since just a few days after the First Fleet arrived in Sydney, and in 1860 a pleasure ground (Balmoral Gardens) was even constructed in the area, but it was not until 1878 that the beach itself was created as a public reserve. Balmoral, with its surf-less beaches (Edwards and Balmoral Beaches are separated by Rocky Point), rolling sand dunes and natural beauty attracted crowds of Sydney residents for picnics and of course bathing but for many years the beaches were difficult to access limiting the success of the area. In the 1880s and into the 1900s access was by ferry to Mosman Bay and thence by foot but in 1905 daily excursion steamers left from Circular Quay for the Spit, stopping at Balmoral along the way. It was the passing of daylight bathing legislation in 1903 which really encouraged the popularity of the area though and soon a number of bathing facilities and clubs were being established. In 1899 Balmoral Baths had been constructed and they were leased to Robert Shearer (hence they became known as Shearer’s Baths) and 1914 Balmoral Beach Club was founded by a group of Mosman residents who called themselves the Smugglers. They used two old tram carriages as changing rooms and purchased land for a timber club house. They had grand plans to provide first aid, protection and even purchase a patrol boat, though many of these were never realised and essentially the club was a recreational swimming and social organisation. To find out more about the history of Balmoral, come back next week. The above postcard, from circa 1910, is an evocative glimpse into the life of poorer Sydney residents in the early 20th century. 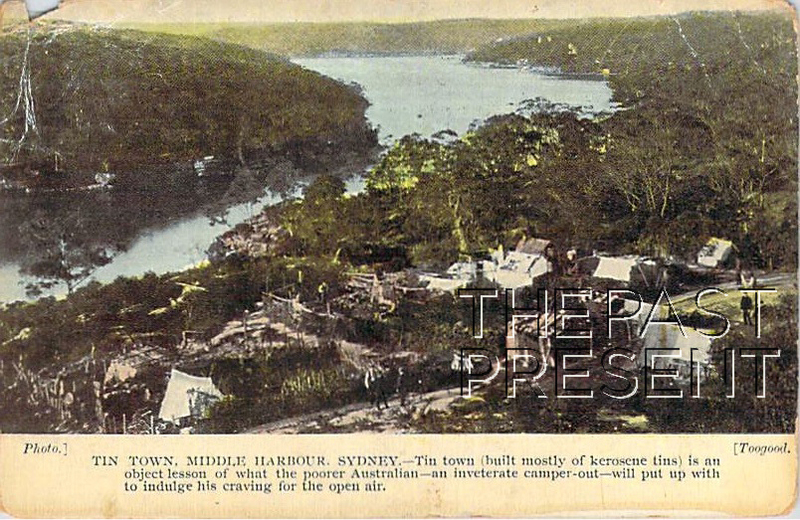 Located on the shores of Middle Harbour, the exact location of this particular camp is something of a mystery, though Mosman Library suggest it is overlooking Quakers Hat Bay near Cremorne. Tin Towns and Depression settlements like the one pictured in this postcard are most often associated with The Great Depression yet many such camps and settlements predate this era. Some such towns were used by the poor, but others were places which were occupied only on and off, by people such as fishermen. The 1890s Depression perhaps was the beginning for many of these camps, but it was the Great Depression which saw their size and number increase. Many Sydney residents had lost their jobs and without an income to support them and pay rent, homes were soon lost too. Often these people took only what they could carry from their lost lives, and set out for one of the many depression settlements around Sydney. People who had lost their homes and their jobs arrived, chose an empty space and erected a ramshackle hut, using whatever materials they could find – often corrugated iron or tin sheeting. Life in these camps was hard, but often a strong and very supportive community evolved.